This times, we will show the energy level diagram for helium atom. We already calculated the ground state, the 1s2s singlet and triplet excited states. We will calculate higher excited states, for example, 1s3s, 1s2p or 1s3p, etc, and included in the diagram. The angular integral was evaluated in the last post. And the radial integral is done using Mathematica. I will use hydrogen 1s, 2s, 2p, 3s, 3p, 4s, and 4p states for basis. Thus, the diagram will contain some of the excited states from some possible combination. The 1s4s and 1s4p state will not be calculated, because there is no room for mixing with higher excited states but only for lower excited states. This will make the eigen state be unbound. During the calculation, one of the tricky point is the identify of the n-th s-state. It is because the mixing is always there, and the mixing can be very large. In order to determine the principle quantum number, we have to check the wave function can see how many peaks in there. Here is the energy level diagram obtained by Hartree-Fock method using limited hydrogen wave functions as basis set. After long preparation, I am ready to do this problem. In the last step, we use atomic unit, such that . And the energy is in unit of Hartree, . We are going to use Hydrogen-like orbital as a basis set. I like the left the , because in the integration , the can be cancelled. Also, the is a compact index of the orbital. Now, we will concentrate on evaluate the mutual interaction integral. From this post, the triplet integral of spherical harmonic is easy to compute. The Clebsch-Gordon coefficient imposed a restriction on . The algebraic calculation of the integral is complicated, but after the restriction of from the Clebsch-Gordon coefficient, only few terms need to be calculated. The general consideration is done. now, we use the first 2 even states as a basis set. We can easy to see that . Thus, if we flatten the matrix of matrix, it is Hermitian, or symmetric. Now, we can start doing the Hartree method. Thus, the mixing of the 2s state is only 3.7%. From He+ to He++, . Usually, the Hartree method will under estimate the energy, because it neglected the correlation, for example, pairing and spin dependence. In our calculation, the energy is under estimated. From the , we can see, the mutual interaction between 1s and 2s state is attractive. While the interaction between 1s-1s and 2s-2s states are repulsive. The repulsive can be easily understood. But I am not sure how to explain the attractive between 1s-2s state. Since the mass correction and the fine structure correction is in order of , so the missing 0.2 eV should be due to something else, for example, the incomplete basis set. The mutual energy is further reduced to 1.05415 Hartree = 28.6848 eV. The . If 4s orbital included, the . We can expect, if more orbital in included, the will approach to . On 11st, March, a M9.0 earthquake strike east Japan around 3pm. this caused malfunction of the nuclear plant, Fukushima Daiichi. i am not going to talk about the malfunction, but on the radioactivity. The radioactivity is caused by nucleus decay into a more stable state. like Carbon-14 will decay to Carbon-13 by beta decay. there are 3 common types of radioactivities: alpha – a Helium nucleus, beta – a electron and gamma – high energy light. the radioactivity was measured by Bq ( Becquerel ), which is 1 decay per second. for a typical radioactivity substance, there may be 10 billion decay per second. think about how many atom in 1 mole of matter. each radiation carry some energy, for alpha decay, energy is about 5MeV, beta decay is 1 MeV, and for gamma decay, it is around 0.1 to 1 MeV. 1 MeV is about Joule. for boiling a water to increase 1 degree, it take 2400Joule. you can see how small it is. 1 more thing to consider is, not every radiation will be absorbed. some will just pass through and leave and no effect. the chance for being absorbed is proportion to the density of the material, or for simplicity, how much weight of the material. for easy understanding, we multiple these 3 factors together, to give us how much energy absorbed per kg. and we call it Gy (Gray), the absolute does. and we can have Gy per hour, Gy per second, depends on the time scale. Thus, for 1Gy, an alpha source, typical 5MeV per decay and a total absorption, it takes 6241 billion hits. for 10 billion decay a second, it takes 10 mins for this does. in other system, people use rad for radioactivity, for example in the game fallout. which is 1 Gy = 100 rad. However, different part of our body have different does limit. so, for 1Gy radiation, our eye will be blinded, but our skin has no effect. therefore, we introduce another does, called Effective does Sv ( Seivert ). it is produced by a weight factor. different part of out body has different weight factor, for lower weight factor, the more easy the tissue will get hurt. we see that the weight factor for whole body is 1, therefore, in general we use Gy or Sv in equal way. And we also observed that, when we eat some radioactive matter inside, the limit does will be decreased by 8 times in out stomach. or to say, the radioactive matter is 8 times dangerous than it is at outside. the reason is, when the matter is inside our body, we will absorb all energy. a typical does is 3.75mSv per year. which means we received 3.75mSv in a year, 0.4uSv per hours. for radioactive effect, there are 3 types of effect: acute ( short term ), late ( long term) and genetic effect ( permanent ) . deterministic mean the chance of having those effect is increase with the radiation increased. stochastic is similar to deterministic, but there is a threshold. below the threshold there is no effect. – Cancer and genetic effect are belong to this group. density is a consideration factor for scattering experiment. 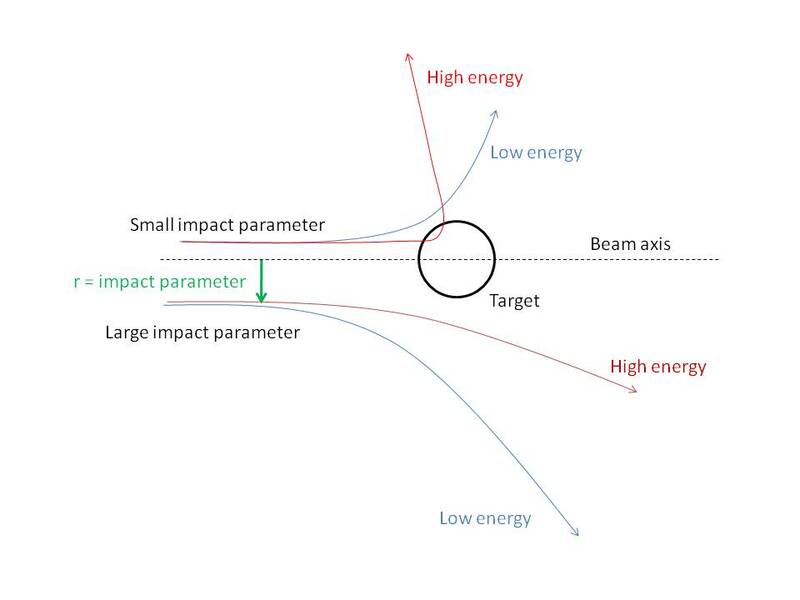 In low density, both for target and the beam, then the probability of collision will be small and experiment will be time consuming and uncertainly increase. Remember that the size of nuclear is 1000 times less then the atom. the cross section area of it will be 1000 x 1000 times lesser. the chance for a nucleus-nucleus collision is very small. for example, if there is only 1 particle in the area on 1 atom, the chance for hitting the nucleus is = 0.000003, 3 in 1 million. it is just more than nothing. thus, in order to have a hit, we have to send more then 3 million particles for 1 atom. in some case, the beam density is small, say, 0.3 million particles per second on an area of 1 atom. then we have to wait 10 second for 1 hit. density is measured in particle per area for target . for beam, since particle is moving in it, time is included in the unit. there are 2 units – flux and luminosity. flux is particle per second, and luminosity is energy per second per area. since energy of the beam is solely by the number of particle. so, density of beam is particle per second per area. but in particle physics, the energy of particle was stated. thus, the luminosity is equally understood as density of beam, and their units are the same as particle per second per area. in solid, the density is highest compare to other state of matter. from wiki, we can check the density. and coveted it in to the unit we want. for example, copper has density . its molar mass is . thus, it has copper atom in . and , which is a huge number, so, the number of atom on is . how about gas? the density depends on temperature and pressure, at and 1 atm pressure, helium has density and the molar mass is 2. thus, the number of Helium atom in is . when the temperature go to -100 degree, the density will increase. beside of the number of atom per area. we have to consider the thickness of the target. think about a target is a layer structure, each layer has certain number of atom per area. if the particle from the beams miss the 1st layer, there will be another layer and other chance for it to hit. thus. more the thickness, more chance to hit. where, is the luminosity and is the flux. for typical green class 4 laser, which has power more then 0.5 W and wavelength is about 500nm. the flux is about photons per second per unit area. if the laser spot light is about 5 mm in diameter. thus, the density of the beam is . for laser pointer in office, which is class 1 laser. the power is less then0.4 mW, say, 0.1 mW. for same spot size, the luminosity is still as high as . on LHC, the beam flux can be . by compare the the density of solid copper. it is much denser. thus, a collision in LHC is just like smashing 2 solid head to head and see what is going on.